In January the world mourned the death of David Kato, a prominent Ugandan LGBTQ rights activist. Social media deeply shaped Kato’s life and death. His name first became known when Ugandan magazine Rolling Stone, which isn’t the U.S. rock-and-roll magazine, published Facebook photos of him and other Ugandans, labeling them homosexuals and calling for their death. Online petitions sprang up around the world, pushing for the Ugandan government to penalize the publication, as Kato and others were threatened and harassed as a result of the article. When Kato was beaten to death by an intruder into his home, who police say was Enock Nsubuga, vigils were quickly organized across the United States, Europe, and South Africa via Facebook, Twitter, and other social media outlets. The United Nations’ High Commissioner for Human Rights, Navi Pillay, addressed the role of the public in decriminalizing homosexuality in her remarks on Kato’s murder. “Today, with the presence of social media and internet-based campaigns, the potential impact of public education is greater than ever,” she said. Around the world each year, thousands of LGBTQ people are murdered, sentenced to stoning, raped, threatened with deportation, or are otherwise harassed. Exact numbers are impossible to calculate worldwide, but in the United States alone, nearly 1,500 hate crimes against LGBTQ people were reported in 2009. Headlines of LGBTQ people undergoing everything from harassment to murder are far more prevalent than they did ten years ago. That’s the good news. The bad news is that extreme violence and discrimination against LGBTQ folks still exists in every corner of the globe. Even so, recent increased attention to human rights abuses that target LGBTQ people reflects greater universal acceptance of LGBTQ rights. And the ways human rights organizations are advocating for LGBTQ rights increasingly relies on young people’s use of social media. While several LGBTQ rights-specific organizations have emerged in that time, major human rights organizations like Human Rights Watch and Amnesty International have also begun to explicitly address LGBTQ rights as part of their larger agendas. International LGBTQ activism typically aims to assist local activist groups and advocate for them in broader ways that would be difficult for local groups to achieve through working alone, like giving testimony on LGBTQ discrimination at the United Nations. Given that LGBTQ rights are so completely unprotected, even unacknowledged, in many parts of the world, the challenges faced by advocates are vast. Using social media networks to elicit support from around the world—whether to put pressure on governments or protest persecution—is an essential, if still emerging, strategy. In Honduras, for instance, the extreme and prolonged violence against transgender people has mobilized several international LGBTQ rights organizations to advocate on their behalf. The LGBTQ rights division of Human Rights Watch (HRW), for example, wrote a comprehensive report addressing the issue in May 2009. When Lorenza, born Luis Alexis Alvarado, was found dead in Comayagüela, Guatemala, last December, her body was so mangled as to be almost unrecognizable. Lorenza was a trans woman who medical examiners concluded had been stoned alive before her body was set on fire. Both IGLHRC and HRW worked closely with local activist groups in Honduras to produce their separate reports and action alerts. On Jan. 31, Human Rights Watch and Red Lésbica Cattracha sent a briefing on the lack of an official response to Honduran President Porfirio Lobo Sosa to the Honduran Ministry of Justice. Stern’s organization issued a similar appeal. After three trans people were murdered in one week, these international groups felt the dire situation merited an immediate response. Their persistence paid off. “The Minister of Security and the Minister of Justice and Human Rights prioritized the case and began an investigation that is unlike any they’ve ever done into LGBTQ related murders,” Stern says. IGLRHRC is also facilitating the participation of Honduran LGBTQ activists in the United Nation Human Rights Council’s review of Honduras this month. But though the groups issued their briefings and letters of protest in a way that reflects traditional activism, the impact they had was amplified by a grassroots support made possible by social media. In its recent press release, the Commission notes that over 1,400 people responded to its email action alert urging the Ministry of Justice to investigate and prosecute the murders of trans people. Stern underlines the importance of numbers. “Because violence permeates LGBTQ people’s lives around the world, we have to be prepared to do mass mobilization, because sometimes, the authorities simply don’t care about LGBTQ people getting killed,” she says. 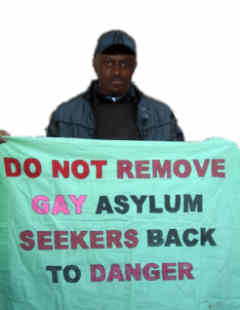 A new group with a new strategySelf-identified lesbian ['BN'] faced deportation from the United Kingdom to Uganda, where she felt her life was at risk because of her sexual orientation. All Out, a group that had formed around the time 'BN' faced deportation, garnered more than 60,000 signatures to letters to the British Interior Secretary. The British government halted N’s deportation. “By the end of the week, after a successful campaign, we had tens and tens of thousands of people signed up. It went crazy viral on Facebook and Twitter, so it became a really compelling story to people,” All Out’s co-founder Joseph Huff-Hannon says. In Honduras, Lorenza was the third trans person to be murdered in a string of six deaths over the course of three months. These murders bring the official count of trans deaths to 37 in a year and a half, an astounding number for a small country with an even smaller trans community. Indeed, Huff-Hannon sees value in the ability to quickly mobilize tens of thousands of people around urgent LGBTQ human rights issues. Of course, while LGBTQ rights and activism are more visible than ever before, a bevy of challenges remain. Lack of funding in a tough fundraising environment was echoed among the organization leaders I spoke as a primary barrier to more and better local LGBTQ activism around the world. “You can’t do endless community building if you can’t house yourself or feed yourself,” Stern says, pointing out that employing queer folks in jobs where they’re safe, appreciated, and doing something they’re passionate about benefits them individually as well as the movement they’re contributing towards. Despite these challenges to the crucial work of international LGBTQ activism, the field has seen growth in the past decade and seems poised to continue to expand and innovate. Stern, like many human rights advocates, sees the assurance of LGBTQ rights as crucial to all human rights. “My perspective is that the strength of social justice work is measured by the well-being of those who are most vulnerable. So the work that we do on gender and sexual rights is actually core human rights work,” she says. In the wake of David Kato’s tragic death, an important and encouraging trend has emerged, putting young people and social media in the center of the battle for LGBTQ human rights worldwide. With such a staggering amount of violence and discrimination to overcome, international and local LGBTQ groups will join online and in-person activism to work toward affecting real change for the people that need it most.